I had very, very, very high expectations for this book. A YA novel that’s dealing with body image is tricky enough to maneuver but when the protagonist isn’t your typical “beauty queen”, it becomes a whole other ball game. Dumplin’ surpassed every single hope and wish I had. I found every significant character to be likable. All of the problems and insecurities they had were real. From the views of sexuality to how being fat and beautiful aren’t interchangeable descriptions, Julie Murphy really did a great job with this book. Of course, there were some things I didn’t like. Using the term “spirit animal” is cultural appropriation and there’s a much detailed explanation about it here. There was a lot of internal judgement from Willowdean towards the other characters, which didn’t sit right with me. Of course, it’s human nature to judge other people and how you deal with it really says who you are, but Willowdean let those judgments make her decisions (ie. not getting to know the “outcasts”). I also wish her relationships with her mom and aunt were explored a little bit more and the reader was shown more about the family’s past. I want a better sense of why Lucy’s loss was so significant. I feel like I started to understand but it wasn’t explored well enough for me to really feel sympathetic. 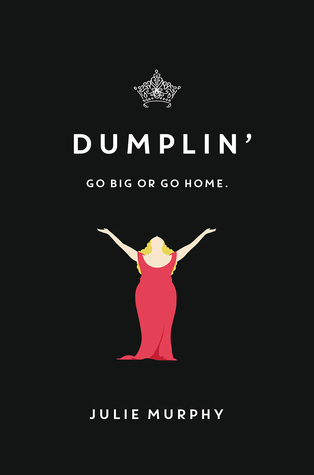 Overall, I’m very pleased with Dumplin’ and I had a fantastic time reading it. If you’re looking for a fun contemporary that digs a little bit deeper this summer, this is the book for you!